School Loop imports terms (e.g. semester, quarter, and year) from your student information system (SIS). In order for School Loop to function properly, the first day and subsequent term need to be set for each term that is imported from your SIS. This is an annual activity unless there is a change in a term or new terms are imported. In such cases, the terms must be set again. In most SISs, each term is given a label. For instance, the first semester might be called S1. These labels are usually common and recognizable. Each term has a start date. Sometimes start dates are the same for more than one term. For instance, S1 and Q1 might both have the same start date. Each term has either a subsequent term or ends with the end of the school year. For example, S2 may be followed by the end of the year while Q2 is usually followed by Q3. School Loop presents terms in a table. The default start date for a new term is the last day of school. We do this because it makes it impossible for anyone to see courses, in effect forced to set the terms. As soon as School Loop has rolled your school over to the new school year and after successfully importing data from your SIS, you must set the start dates for each term. 1. 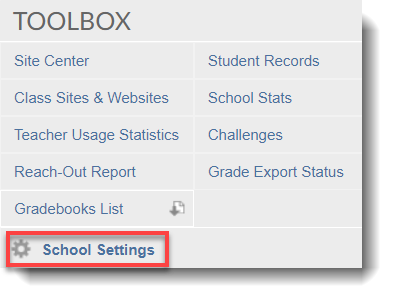 Login to your School Loop account then click School Settings Quick Links or Toolbox section on the right side of your portal. 2. ClickGo next to Terms. 3. Click on the Set button to the right of the term. 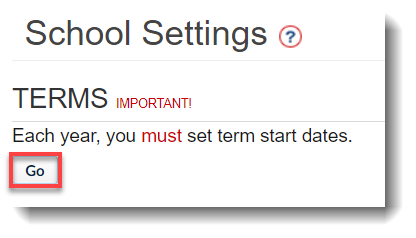 Enter the correct start date, and select the following term. If there is no following term, choose "End of School Year". 4. Click the Submit button when ready. 5. Repeat this procedure for each term. Once you've set the terms, it is a good idea to spot check teacher and student schedules to make sure they are correct. Click the link to learn how to verify imports.